This tutorial builds on the foundation laid by previous tutorials. If you completed the Curves and Splines tutorial then you're good to go. 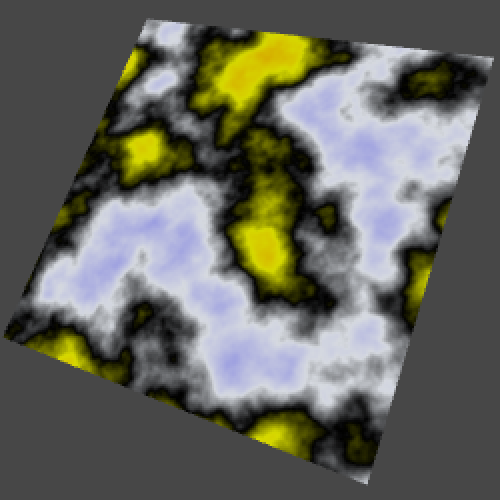 A slice through colored 3D Perlin noise. Let's begin by creating a default quad object. This object has a mesh with two triangles that form a square with a width and height of one unit each. We can make the quad more interesting by giving it a material with a nice texture. 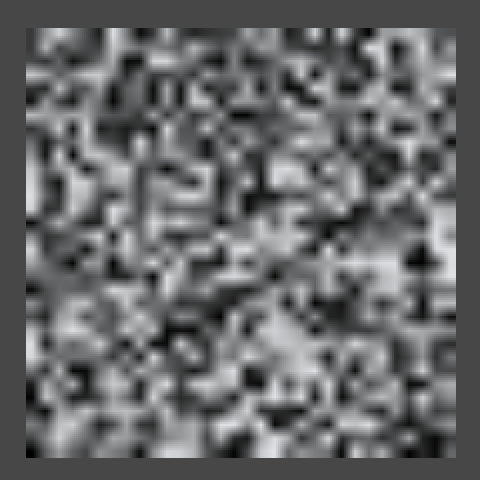 We could use any image as a texture, but we're going to create one procedurally. 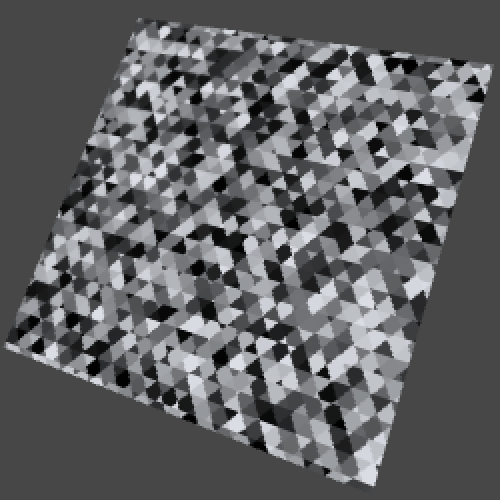 For this we need a material to assign the texture to, so create one and have the quad use it instead of the default. 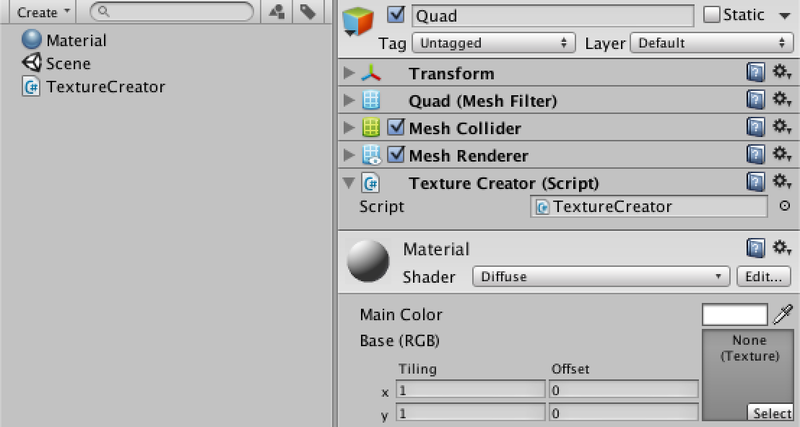 Then create a TextureCreator component script and attach it to the quad as well. 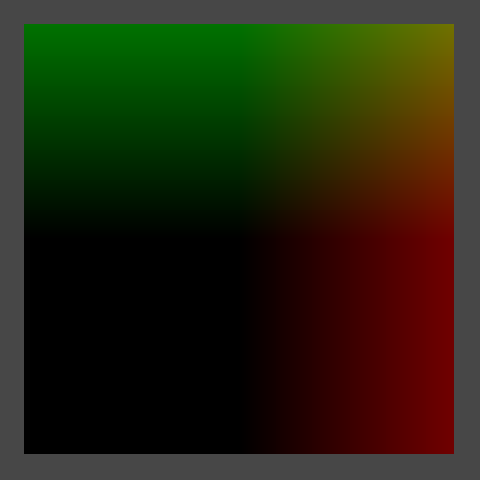 Why not use a procedural shader? Quad with custom material and texture creator. 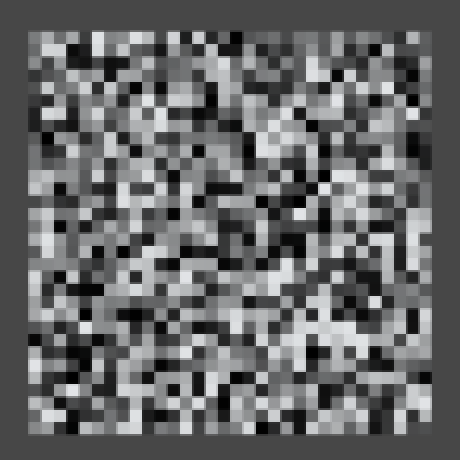 To create a texture, we need to know how many pixels it should have. 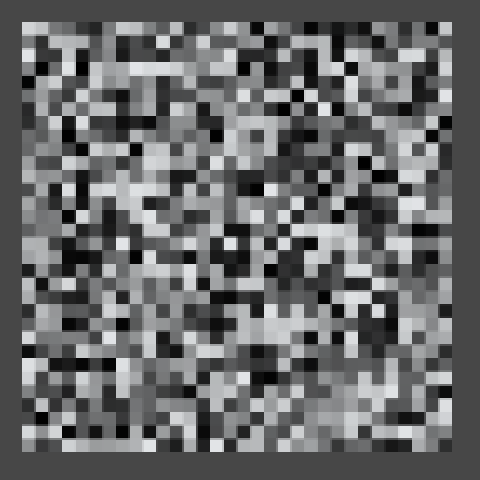 We'll create a square texture, so we can control its size with a single resolution variable. Let's give it a default of 256. We will create the texture when our component awakens. As we won't use transparency, the texture's format is RGB. The fourth argument of the texture's constructor indicates that we want to use mipmaps. We also give it a descriptive name. Then we grab the MeshRenderer component of the game object. 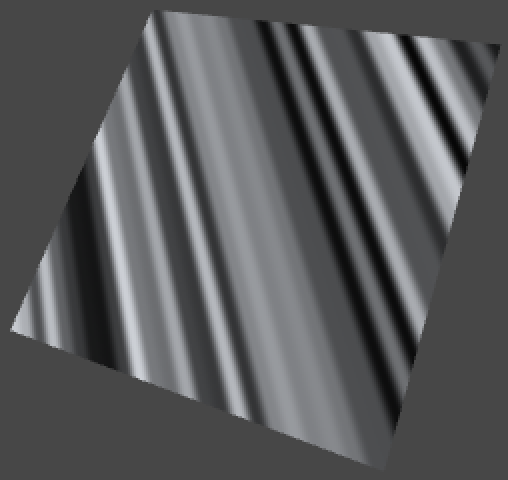 Because we're only using it with our quad object, it should exist so we directly assign the texture to its material. Quad awakens with a texture in play mode. Without filling the texture this doesn't make much sense. So let's add a FillTexture method that uses a double loop to make all the pixels red. 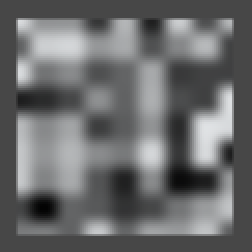 After setting the pixels, you have to call the texture's Apply method otherwise the changes won't show up. Don't like red? What about green? Go ahead and change the color, but do this while still in play mode. 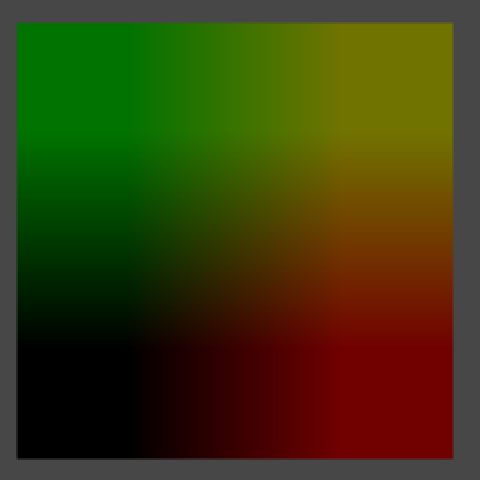 You will see that Unity recompiles the code just fine, but the texture stays red. This is because Awake isn't called again when there is a recompile. However, there is another option. The OnEnable method is called directly after Awake, each time the component is activated. This also happens after a recompile while in play mode. So if we use OnEnable instead of Awake, our quad will turn green without having to toggle play mode. A flat color is not interesting at all. Instead, we can use a pixel's coordinates to define its color. We can directly put x in the red channel and y in the green channel, leaving blue at zero. However, as color channels are defined in a 0–1 range, we have to divide by the resolution, which we can define outside the loop. 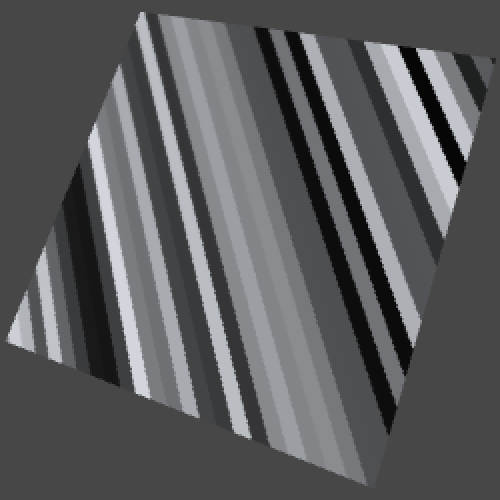 Have now visualized the texture coordinates, also known as uv coordinates. But there is something weird going on at the edge of the texture. It is easier to see this when using a smaller resolution. Unfortunately, changing the resolution has no effect while in play mode. Let's create a custom inspector for our component so we can easily detect any change to our component. It simply draws the default inspector and checks for changes. If a change happened while we are also in play mode, we should call FillTexture. Of course this means that we have to make FillTexture public. And it should also check whether the resolution has changed, and if so resize the texture. Let's also constrain it to some reasonable range, like 2–512. Scrubbing the resolution, still in play mode. We can do even better than that. We can also respond to undo and redo actions, while in play mode. We can do this by registering a method to the Undo.undoRedoPerformed delegate. So we create such a method and place the check whether we're in play mode there as well. TextureCreatorInspector has to register the method when it is enabled, but should also unregister it when it is disabled. So add the appropriate methods, and also store a reference to our creator so we don't have to cast it every time. UV colors at resolution 8. Back to our weird edges! At a resolution of 8, it is a lot easier to see what is happening. At the edges, colors from opposite sides are blended together. This happens because the default wrap mode of textures is to repeat themselves. 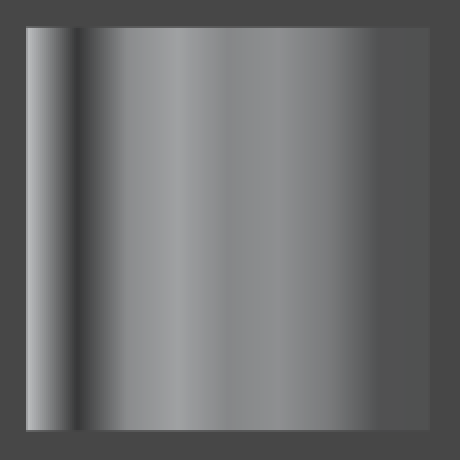 We can get rid of this by having TextureCreator set its texture's wrap mode to clamp. 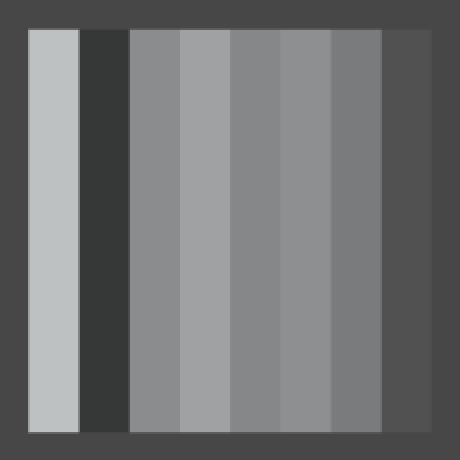 Why are we actually seeing a smooth color transition, if our texture is only 8 by 8 pixels? This is because the default filter mode is bilinear. Let's compare this with point filtering. Now we see 64 blocks of solid colors, although an optical illusion will make it look like they contain gradients. 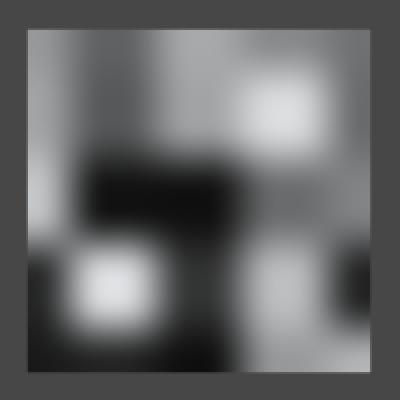 For each rendered pixel, point filter mode selects the color of the texture pixel that it covers. 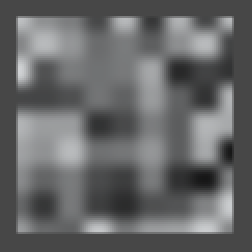 This visually tells us where the centers of our texture's pixels are, right in the middle of those squares. 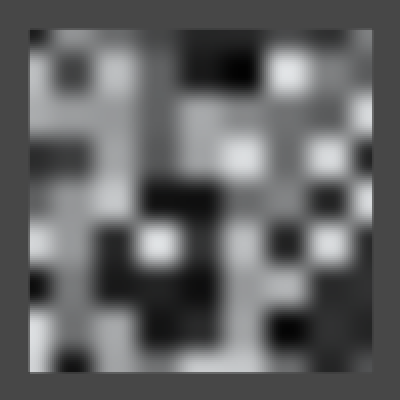 Bilinear filtering linearly interpolates between those pixel centers. Let's compare them again at a resolution of 2. 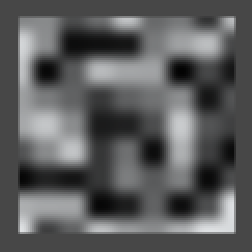 2 by 2, point and bilinear filtering. 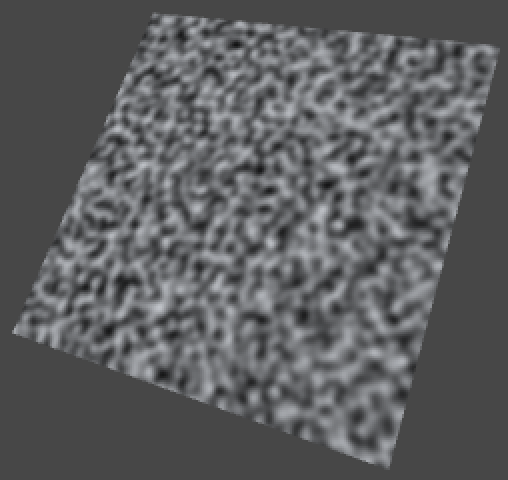 So the center of the bottom left texture pixel has uv coordinates (0.25, 0.25). The top right is at (0.75, 0.75). 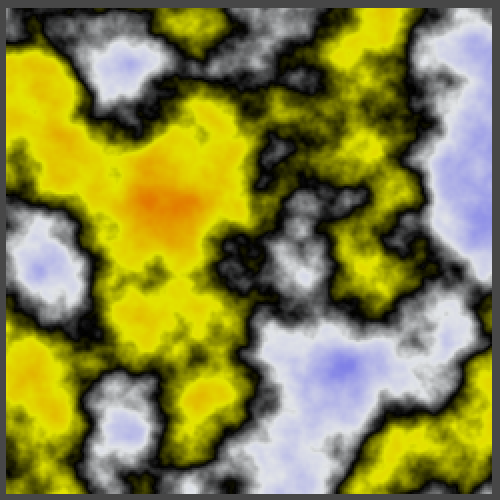 However, in FillTexture we currently compute the colors for (0, 0) and (0.5, 0.5) respectively. 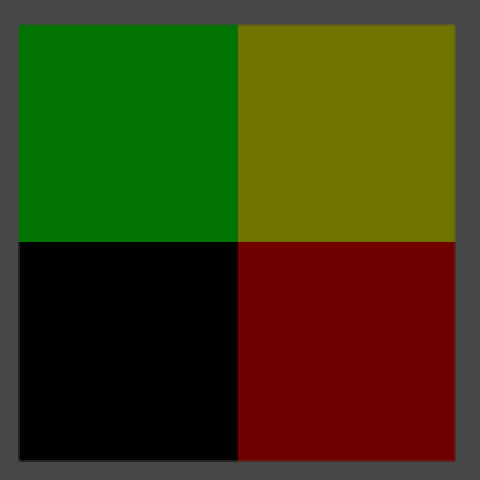 This means we are calculating the colors at the bottom left corners of our pixels, instead of their centers. To fix this, we need to add half a pixel to x and y. 2 by 2, correctly centered. 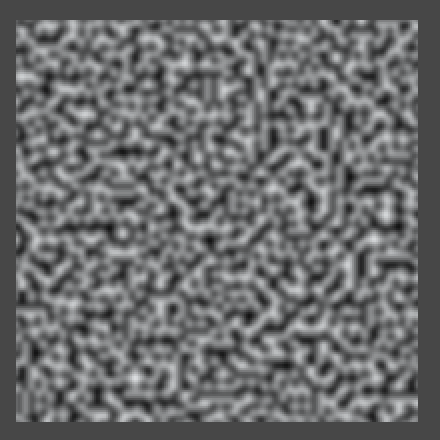 You can let the pattern repeat inside the texture by using the remainder operator. For example, by taking the remainder of dividing by 0.1 we end up going from 0 to just below 0.1 ten times. To keep the result visible, we simply scale it up by ten. After doing that, zoom out the scene view to see what happens. 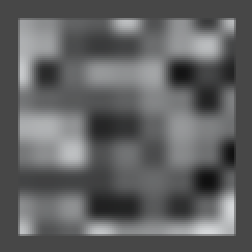 Especially when zooming out far, you'll see the image gets sharper and then suddenly blurrier a few times. This happens because of mipmapping, which we have enabled. We can disable this by setting our texture's fourth constructor argument to false. Zoomed out, with and without mipmapping. Mipmapping definitely produces better results when zoomed out, but it is unfortunate that there is a harsh transition between successive mipmap levels. You can also see some of these transitions when looking at the quad from a sharp angle, especially when in motion. The quad will probably turn dark in the scene view when seen at an angle, because of the way scene view lighting works. To temporarily solve this, you can enable lighting in the scene view by toggling the light button in its toolbar, and create a directional light. Fortunately, there is a trilinear filtering option which also interpolated between adjacent mipmap levels, so let's use that. 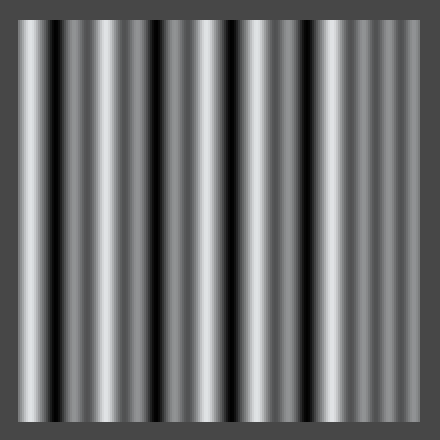 With trilinear filtering, our texture is now displayed smoothly, without sharp transitions. The downside is that it gets fuzzy quick when viewed at an angle. To improve this, we can use anisotropic filtering. 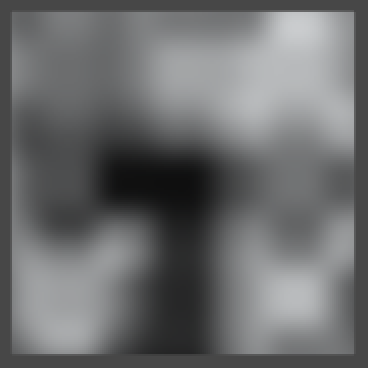 It is enabled by setting the texture's aniso level to a value higher than one. Let's set it to nine, because that's the highest level. Let's leave our texture with these settings. But while we're at it, we shouldn't create a new one each time our component is enabled. So add a check for that. 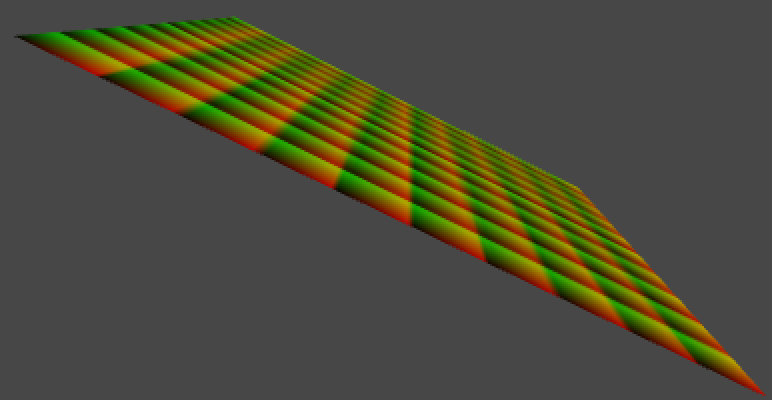 Right now we are visualizing the uv coordinates of our texture's space, which is always the same. We can change this so we are visualizing world coordinates instead. Our quad will act like a measuring device for world coordinates. First, let's define the local coordinates of the four corners of our quad. Because it is centered on its own origin, these are (-0.5,-0.5,0), (0.5,-0.5,0), (-0.5,0.5,0), and (0.5,0.5,0). We name them pointxy, where x is 0 for the left side and 1 for the right size. Likewise, y is 0 for the bottom side and 1 for the top side. Second, we linearly interpolate these corners inside our loops. We do this in two steps. Step one is to interpolate between the bottom left and top left corner based on y, which gives us a point on the left side. We name it point0. We do the same thing for the right side, naming the result point1. Step two is to interpolate between these intermediate points based on x. 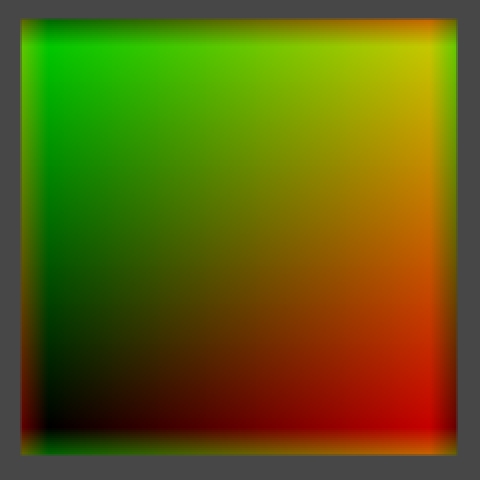 We have now used bilinear interpolation to find the final point, which we directly convert into a color. We are now visualizing the local coorindates of our quad. So it is always black at the center. It is also black at the bottom left because those coordinates are negative and colors are clamped to the 0–1 range. To visualize world-space coorinates instead, all we have to do is transform our four corner points to world space. However, moving the quad currently doesn't cause the texture to change. We could add an Update method and simply fill our texture every frame. That will ensure that the texture is always up to date. Let's do this, but also check whether our quad's transform has actually changed. That way the texture is only refilled when necessary. Now you can move, rotate, and even scale the quad and it will immediately change its color to match to world position it occupies. World coordinates on a rotated and scaled quad. Visualizing world coordinates isn't very interesting. Instead, we could visualize some mathematical formula, like a sine wave. Such formulas are regular and predictable, while we often need irregular and unpredictale shapes. 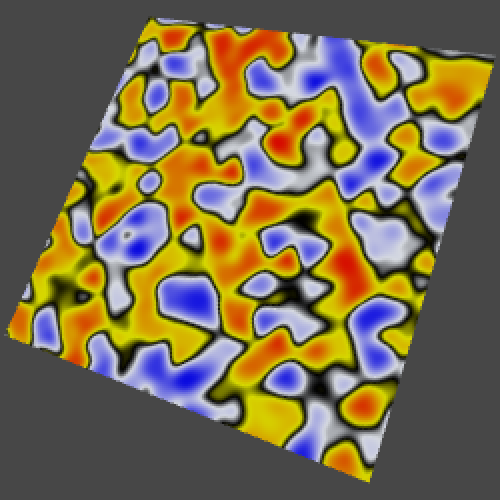 For example to simulate dirt, rust, fabric irregularities, and other patterns that appear random to us. A naive approach is to simply use Random.value. 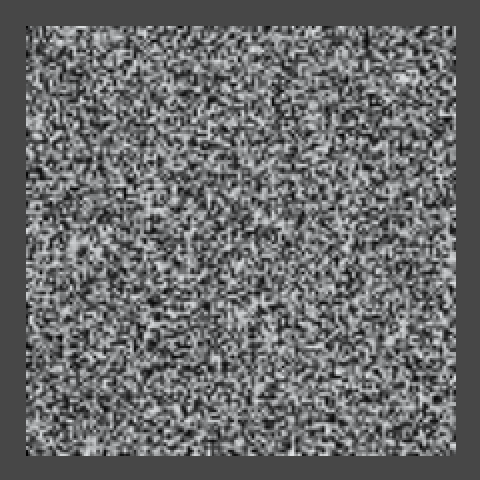 Unity's random methods use a function that computes its next number based on some of its previous numbers, in such a way that we cannot easily see a pattern. The result sure looks random. 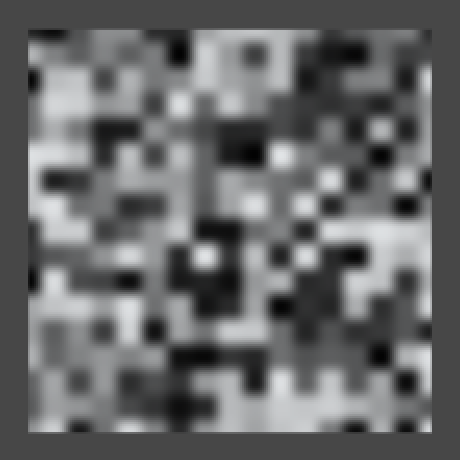 Unfortunately, it is so random that we get a different result each time the texture is filled. 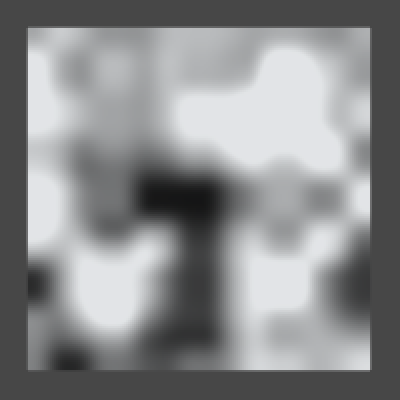 This is because the random sequence continues from where it ended after the previous texture fill. But we don't want this, we actually want pseudorandom noise that produces the same results each time. We can solve this by choosing a fixed initial value – known as a seed – before filling the texture. Now we get the same pattern each time. That is, until we change the resolution of the image. 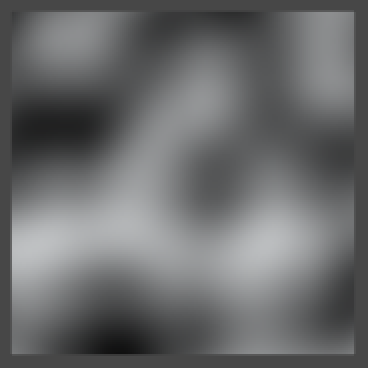 The value sequence does not depend on the pixel uv coordinates, but on the order in which the pixels are filled. The left side of the bottom row stays the same as you increase the resolution, but the rest of the sequence shifts as it gets applied to longer rows. The same sequence at resolutions 32, 64, and 128. This won't do. We want our pattern to be independent of the resolution and order in which we fill our texture. It is time to write our own pseudorandom noise code! Create a script named Noise and turn it into a static class. This will become our noise library. What we want is a method that, given point in 3D space, returns a seemingly random value. Let's just return the point's x coordinate for now. Now we can change the FillTexture method of TextureCreator so it uses this new method. Also remove the assigment to Random.seed, because we no longer need it. Of course Noise.Value doesn't produce anything that looks like noise yet. But how do we generate such a pattern? 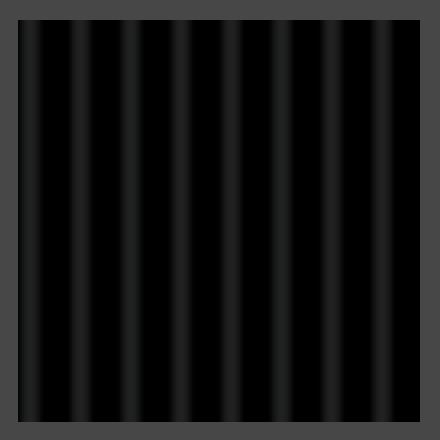 Let's start very simple, with alternating stripes of black and white. 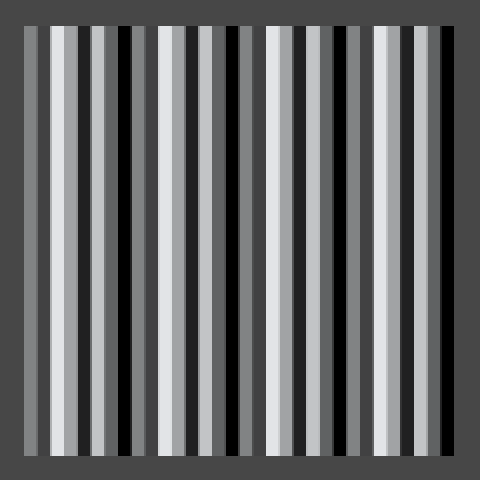 We can generate vertical stripes by casting the point's x coordinate to an integer, discarding its fractional part. Then we return 1 when the integer is odd, otherwise we return 0. We could do this by returning the remainder of dividing our integer by two. 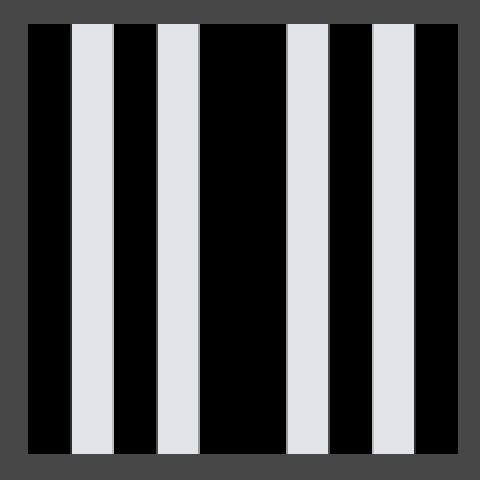 We should now see unit-length stripes on our quad, but only if we move it far enough to the right or increase its scale. We could get a better look at our pattern if we scaled it down. Let's do so by adding a frequency parameter to our method. The idea is that if the frequency is doubled, the pattern changes twice as fast. We can do this by simply multiplying the point by the frequency. Then add a public frequency variable to TextureCreator so it becomes configurable, and pass it to the noise method. Half the stripes at frequency 10. 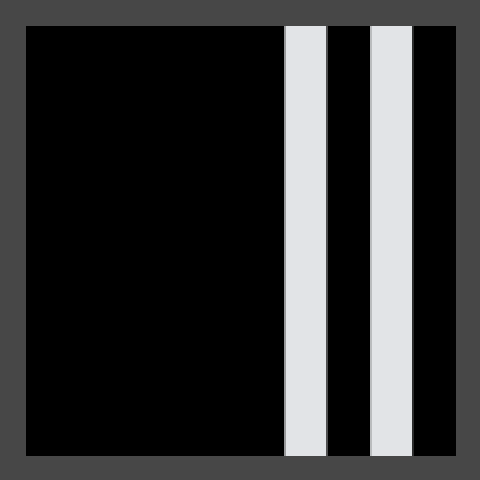 Assuming the quad is not transformed, at a frequency of 10 we can see a total of five stripes – three black and two white – on the positive side, but nothing on the negative side. That's because the remainder on the left side is either zero or negative one. So we should return the absolute value of the remainder. Alternatively, because integers are stored as binary numbers, we can look at the least significant bit to determine whether the number is odd. This can be done with the bitwise-and operator, discarding everything except the least significant bit. As a bonus, this approach is also very fast. 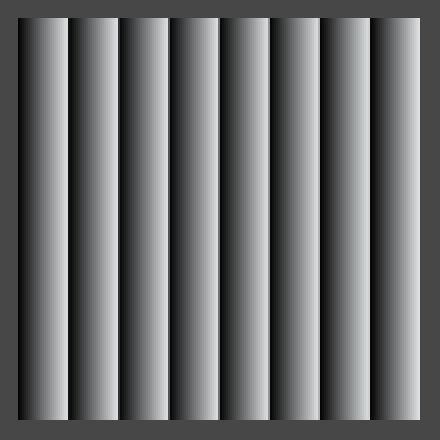 The stripes now appear on both sides, but the pattern is mirrored, which causes a gap. As casting to an integer discards the fractional part of a float, it effectively rounds down on the positive side, while rounding up on the negative side. We could solve this by subtracting one when on the negative side. But there's also a convenient method that does this for us, so let's use that. Now that we have produced a correct pattern by partitioning space, we can build our noise on top of that. Such noice is known as lattice noise, because it divides space into a regular lattice. In this case it's regular 1D intervals, while in 2D it would be a square grid and in 3D a cube grid. 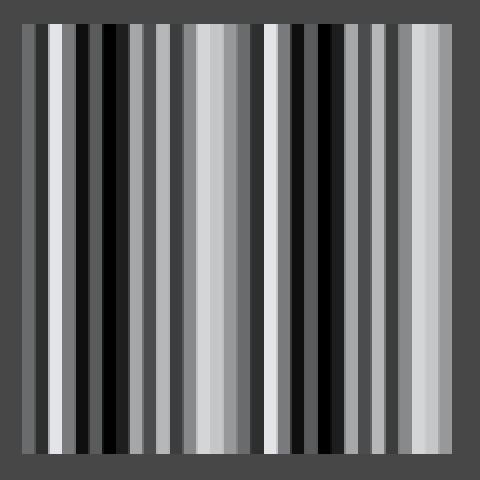 The next step is to assign seemingly random values to each stripe coordinate, instead of just alternating black and white. 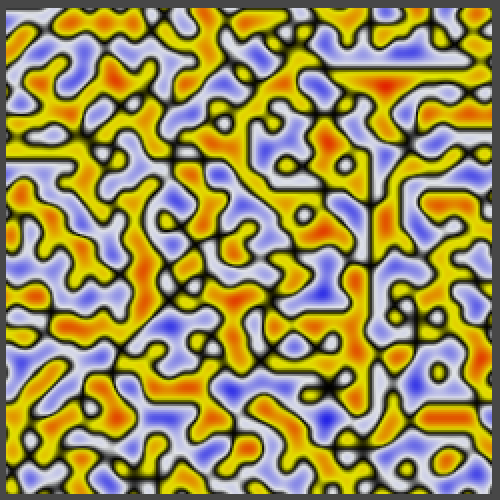 This is done by using some function that converts any lattice coordinate into some other value. Such a function is known as a hash function, and there are many different flavors of those. We will use a permutation array as our hashing method. This is simply an array containing a bunch of integers, let's use 0 through 7. If we were to use our integer coordinate to index this array, we'd get a value up to seven. Let's do that and scale the result so we stay in the 0–1 range. However, this will result in an error as i goes out of the index range of our array when it goes above seven or below zero. Because our array has a length of eight, if we limit ourselves to the three least significant bits of i, the index will wrap around exactly when it needs to. Using the hash array with frequency 32. We now see up to eight different colors, but the pattern is still obviously regular and repeating. Let's make it less obvious by shuffling the values inside the array. That will result in a different permutation of the same collection of numbers. This is why such an array is often named a permutation array or a permutation table. The pattern now looks less regular, but it still clearly repeats. What would happen if we add another permutation of the same sequence to the array? As this increases our array's size to 16, we also need to add an additional bit to our bit mask. Using two permutations in one array. We simply got a larger sequence that contains each value twice. We might as well make every value unique and increase our output range to 16 different values. The hash array will always produce a tiling pattern, but we only notice that when we see a large enough sampling of it. So let's increase its length to 256. If we also define the hash mask value as a constant, our method will work regardless of the array's size. 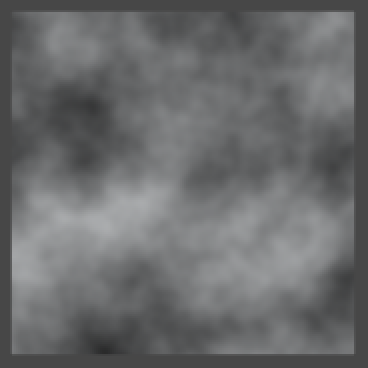 256 values, at frequency 32, 256, and 512. 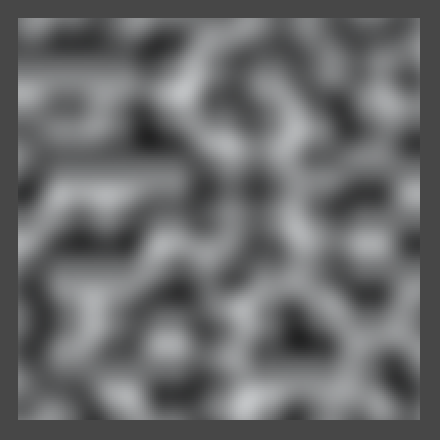 This particular permutation is the same one that Ken Perlin uses in his reference implementations of his noise algorithm, which we'll cover later. Besides that, there is nothing special about it. With this array it takes a while before we see it repeat. When using a frequency of 512 we can see that it repeats once, but at that point we can't even see the individual lines anymore. You can increase the array size even more, or use other tricks to dramatically increase the period length, but 256 suffices for most cases. Let's extend this approach to two dimensions. Duplicate the Value method and add a 1D and a 2D suffix to them. 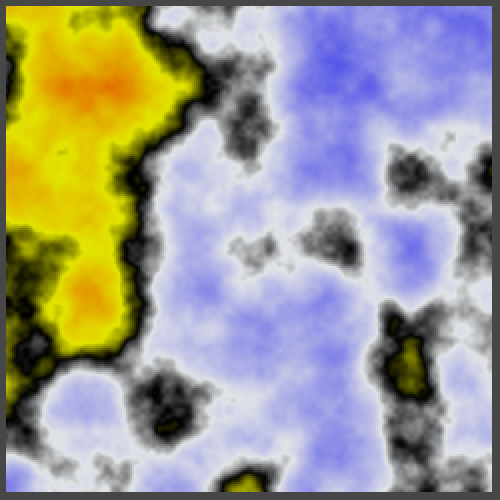 Then change TextureCreator.FillTexture so it uses the 2D version of our noise method. Now we have to give the y coordinate the same treatment as the x coordinate. So add a second versions of the i variable, naming them ix and iy. Instead of directly returning the hash of ix, we'll add it to iy and use that to index the hash array a second time. Of course, we need to make sure that their sum remains within bounds. It looks pretty random, right? We are offseting the hash index of the y coordinate by the hash result of the x coordinate. But this means that the vertical patterns are all the same, they're just placed at different offsets. You can spot this in the image above if you know where to look. It contains two adjacent columns that are offset by exactly one step. This happens because the fourth and fifth numbers in the hash array are 91 and 90. So in case you cannot find them, they are the fourth and fifth column to the right of the center. So should we eliminate all such sequences from the hash array? No, because there are many more small patterns that become obvious once you are aware of them. Instead of improving the hash array, you're better off using a different hashing method altogether. But again, for most purposes the illusion of randomness is convincing enough. 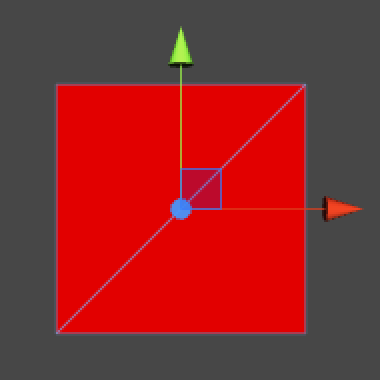 Of course there is also a third dimension, so let's copy our 2D method and change it into a 3D one. The approach is the same as going from 1D to 2D. Although the method is entirely new, I've only marked the adjustments needed to take the third dimension into account. Why are we actually masking iy and iz, if we mask them again after adding them to a hash? That is a good question, because a mask operator after adding should suffice. What you'll actually encounter a lot in practice is that the additional hash doesn't happen. But then the maximum possible index that we could get is 255 + 255, which is clearly out of bounds. This problem is solved by doubling the length of the hash array, repeating its contents. That way indices 256 through 511 give the same result as indices 0 through 255, so a new mask operation is no longer needed. So let's do that as well. 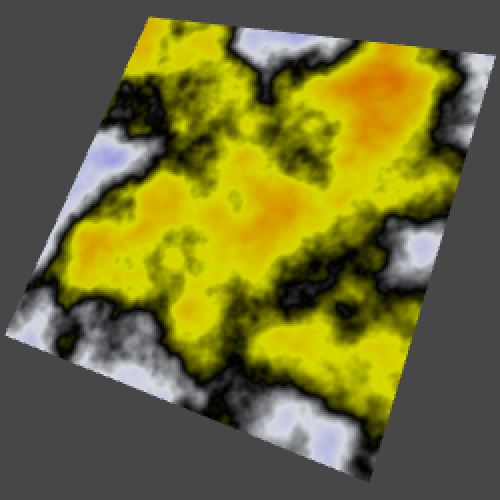 Now we could once again change which method we use in our texture-filling loop, but that is getting tedious. Let's make it configurable instead. Begin by creating a delegate type for our noise methods. As it belongs with the noise library place it in the same script, but outside of the Noise class. 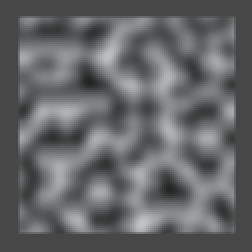 Then add a public static array containing references to the value methods to Noise, ordered by their dimension. 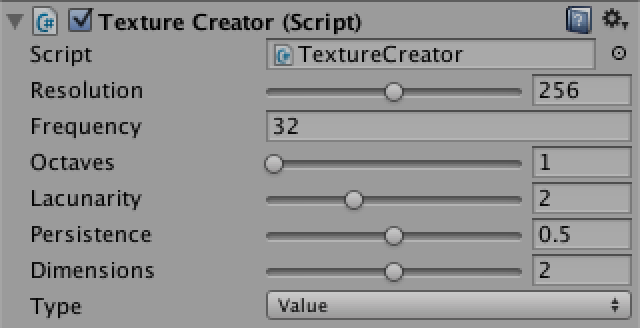 Also add a public dimension variable to TextureCreator so we can configure which noise value it should use. To limit the value we can set it to via the inspector, give it a range from 1 to 3. Now we can let TextureCreator.FillTexture select the desired method from the value methods array, using dimensions minus one as an index. Then we can call this method to get our noise value. 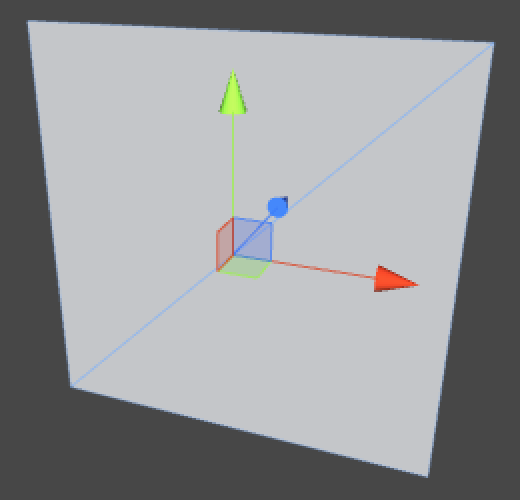 3D hasing and a dimension slider. 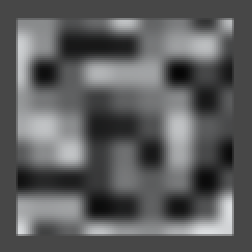 If our quad is not rotated, the 3D version of our noise looks similar to the 2D version. The only difference is that the values are hashed an additional time by the 3D method. This similarity vanishes when we rotate the quad so it is no longer aligned with the world axes. 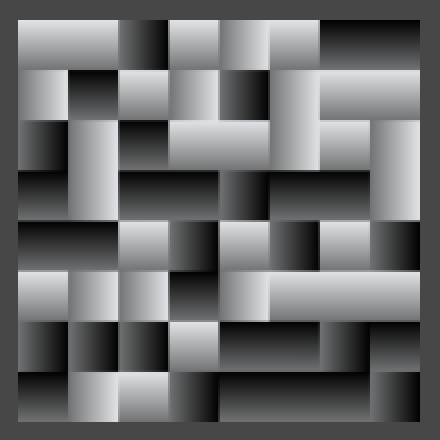 1D, 2D, and 3D hash values with rotation (45,45,0). 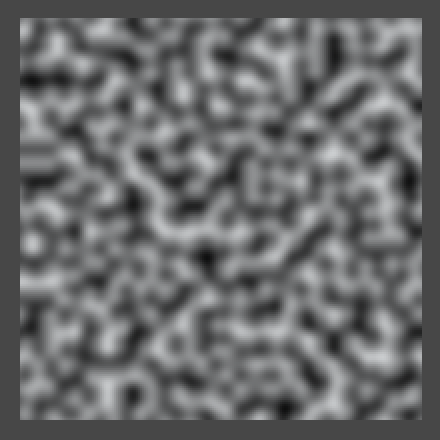 We can now produce reasonably random-looking patterns that are also resolution-independent. However, there is a sharp transition between adjacent hash values, which is most often undesirable. Instead, we want a pattern that smoothly transitions from one hash value to the next. For our 1D noise version, that would mean instead of one hash value we'll have to compute two. One for the lattice coordinate to the left of our sample point, and one for the lattice coordinate to the right of it. Let's rename i to i0 and add i1 to represent the next coordinate. We then retrieve the hashes for both of them, which we store in h0 and h1. Now we have to interpolate between h0 and h1. The linear interpolant value is simply the distance from the left integer coordinate to the sample point. As we must compute this before masking the coordinate, we store this value in a new variable t.
Sharp vs. linear transitions in 1D. 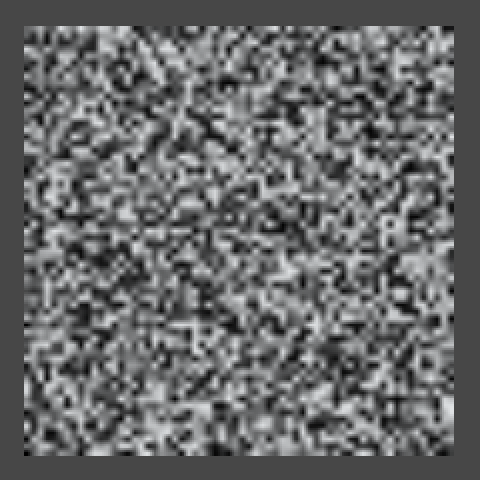 This particular type of noise is known as Value noise. Although the values of our noise are now interpolated, there are still sharp transitions. This is because we now see adjacent linear gradients that abruptly change direction. Instead of directly using the linear distance, we can turn it into a smooth curve by using a function that has a first derivative which is zero at both ends. That way the rate of change is always zero at gradient boundaries. Actually, let's go a step further and use a function with a second derivate that has the same properties. Such a function is 6t5 - 15t4 + 10t3. Let's add a method that puts t though this function. Because we don't have an atomic power operation, we program it using multiplications only, for example as t t t (t (t 6 - 15) + 10). Why a 5th degree polynomial? Now we can smooth t before using it to interpolate between our hashes. 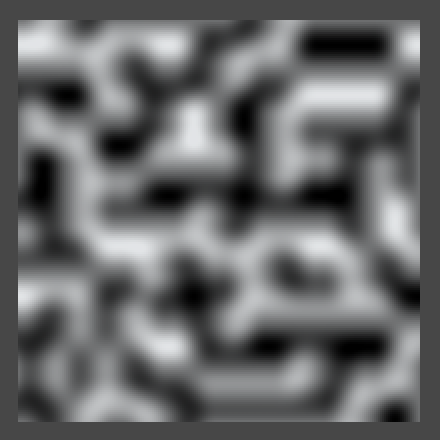 The 1D noise only needed to interpolate along the x axis, but the 2D version also needs to interpolate along the y axis, performing a bilinear interpolation between four hashes. First, let's rewrite Value2D a bit so it has the same structure as the 1D version. Then add the hash of the opposite corner. But of course we need four hashes, not only the bottom left and top right ones. 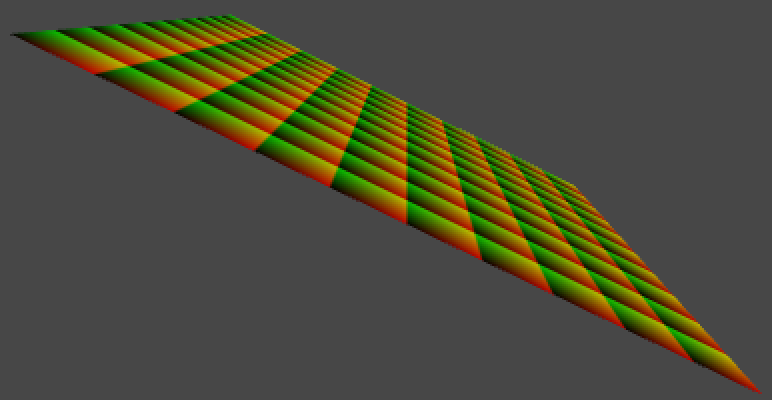 And finally, we create the interpolants and perform the bilinear interpolation. When applying this approach to three dimensions the process is the same, it just gets bigger. you end up with eight hashes and need to perform a trilinear interpolation. I've copied the 2D code into the 3D method and marked the changes from there. 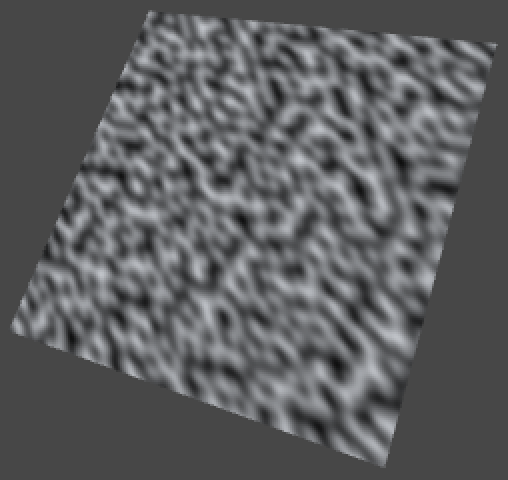 3D Value noise, moving to the next z coordinate in the lattice grid. 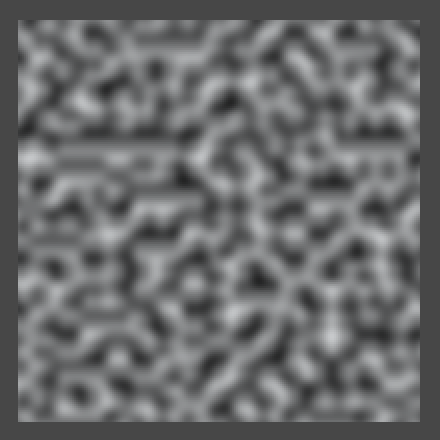 The 3D noise still appears the same as 2D noise when looking along the z axis. 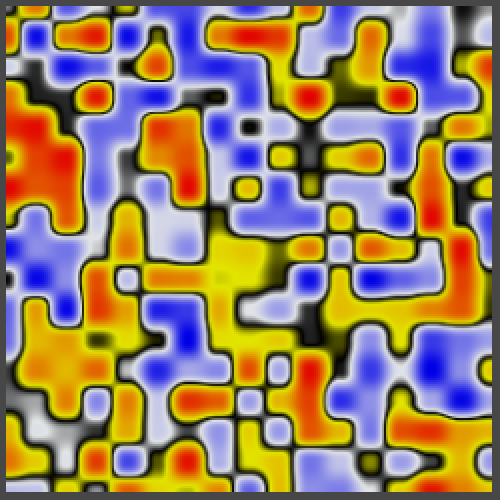 But now it smoothly morphs into a new pattern when moving along z, instead of abruptly changing. 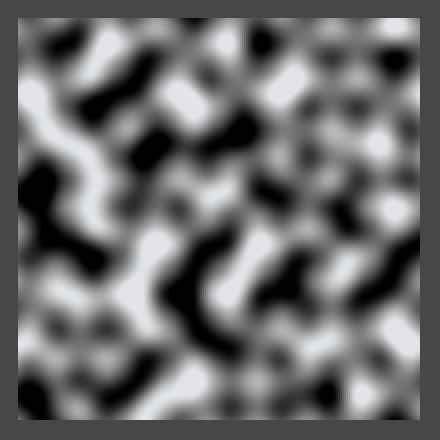 Because the rate of change is zero at the lattice points, when moving at constant speed the noise appears to pulse, oscillating between pure 2D patterns and fuzzy blends. Of course the picture changes dramatically when you rotate the quad. 1D, 2D, and 3D Value noise with rotation (45,45,0). 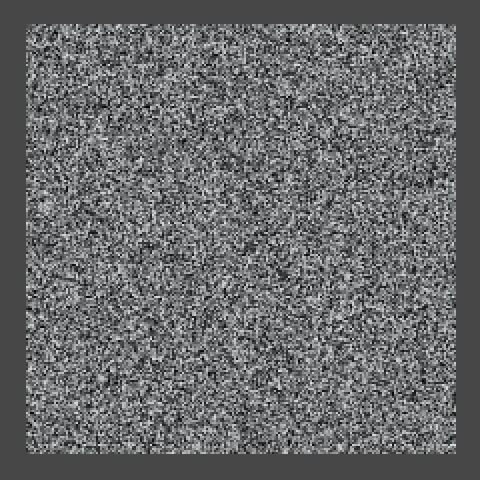 While Value noise is smooth, it has a blocky appearance. The patterns look random but are clearly constrained to a grid, which is undesirable when trying to create a more chaotic or natural-looking surface. Until now we've selected a single fixed value per lattice coordinate, which means only the intensity of the image varies. If we could somehow add more variety – especially a sense of direction – we might be able to obfuscate that we're using a grid. A solution is to associate gradients with each lattice coordinate, instead of constant values. If we orient those gradients in different directions and then interpolate between them, then the grid becomes a lot less obvious. 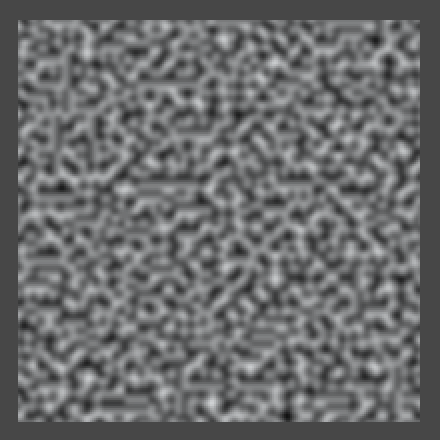 As Ken Perlin was the first to use this technique, it is known as Perlin noise. 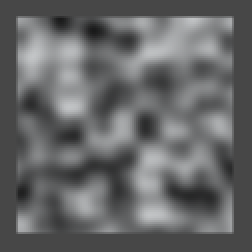 So let's create some Perlin noise! Begin by copying the three Value methods in Noise, renaming them to Perlin. Then also add a perlinMethods array. Let's go one step further and create an array of noise method arrays as well, containing our two existing arrays. Then add a noise method type enumeration, which can be used to index the double array. 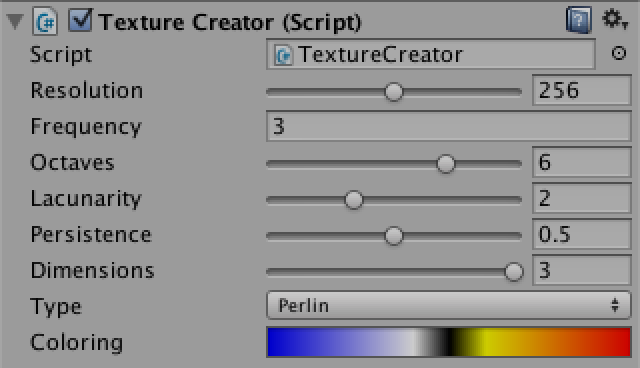 Now we can add another configuration option to TextureCreator, so we can use the inspector to switch between Value noise and Perlin noise. Selecing which noise type to use. 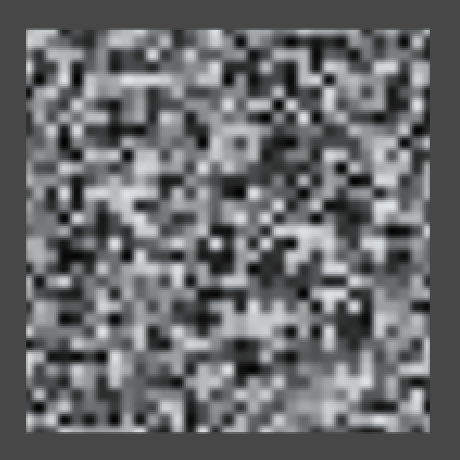 Of course we see no change yet when switching to Perlin noise, because those methods are still producing Value noise. So how how do we convert from using hash values to using hash gradients? 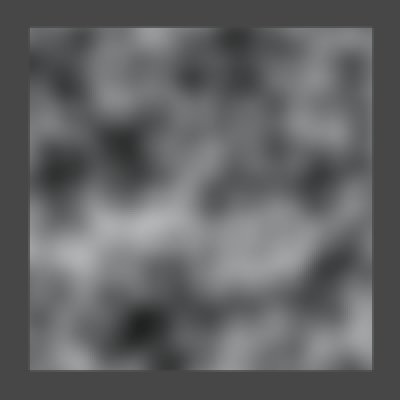 Let's consider one-dimensional noise first, which so far is simply interpolating between two hash values. The most basic one-dimensional gradient function is g(x) = x, which is simply x unmodified. In our case, we are only interested in the values of x in between two integer coodinates, so we can use our t variable, before it is smoothed. Let's visualize this gradient by simply returning t, ignoring the hashes for a moment. 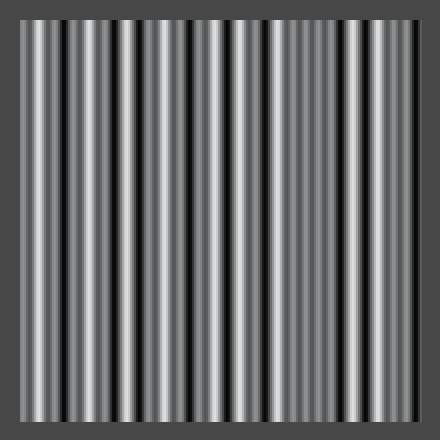 Now every stripe has the same gradient, except that they are offset from one another. So for every t0, the gradient to the right of it is t1 = t0 - 1. Let's smoothly interpolate them. 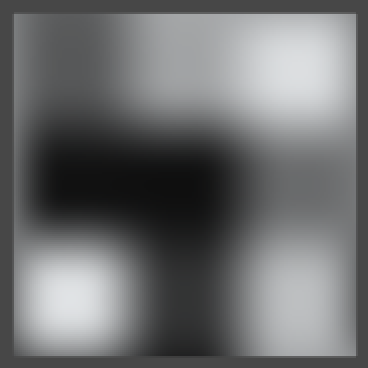 The resulting image is dark because the gradients cancel each other out. 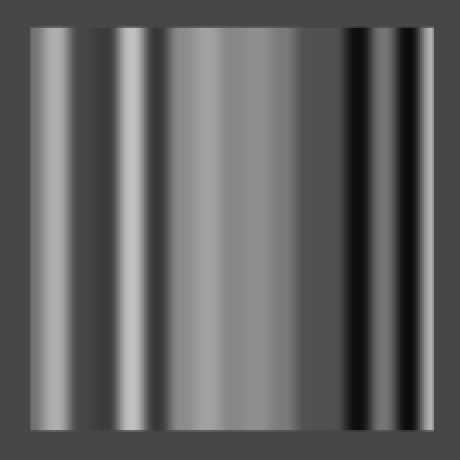 Had we used linear interpolation it would be completely black, but because we're using smooth interpolation each gradient gets more dominant as it approaches zero. As the t1 values go below zero, we don't see them. 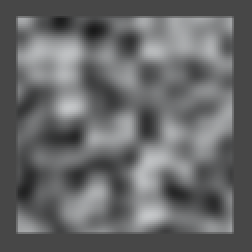 Indeed, Perlin noise can procude both positive and negative values. Ideally, its range is -1–1. To make this range visible, TextureCreator.FillTexture has to scale and offset the noise samples so -1 becomes 0, 0 becomes 0.5, and 1 stays 1, but we shouldn't do this when using Value noise. To reintroduce randomness, we have to convert the hash values into gradient functions. Assuming we have an array of 1D gradients, we can simply use the hash values to index this array, applying a mask so the arrays don't need to be the same length. For gradients, we simply pick the two directions of movement possible in one dimension. This means we end up using positive gradients for even hash values, and negative gradients for odd hash values. After retrieving these gradients, we compute their values at the current point by multiplying with t0 and t1, which can then be interpolated. 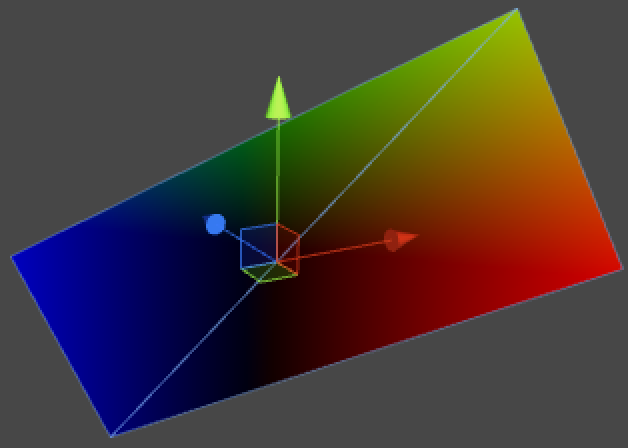 Now adjacent gradients can point in either the same or opposite directions, going either up or down. So there are four possible transitions, and the order in which they appear depends on the hash values. 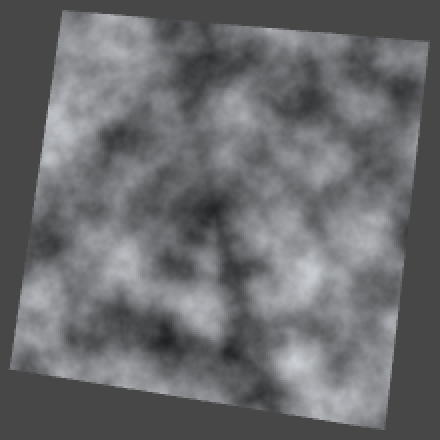 While this is already 1D Perlin noise, it doesn't yet cover the entire -1–1 range, so we need to normalize it. So what is currently the maximum possible value? If we were to linearly interpolate two gradients pointing in opposite directions, they would both be 0.5 at the halfway point, which means their interpolation is also 0.5 there. As the gradients start at zero, this must be the maximum possible value. Smoothly interpolating does not change this maximum. So doubling the result will produde the desired range. 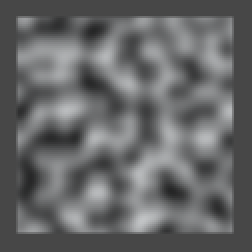 For 2D Perlin noise we have to perform the same steps, but now in two dimensions. First, we need 2D gradient coefficients, so we need to use Vector2 structs instead of floats. The most obvious gradient choices are right, left, up, and down, so let's pick those. This time we're using gradient functions of the form g(x, y) = ax + by, where a and b are either -1, 0, or 1. Let's add a convenient method to compute this function for us, given a gradient vector. 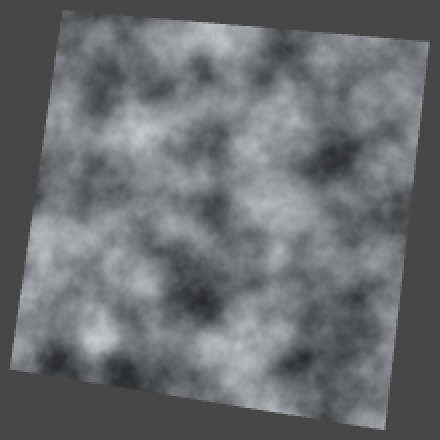 Next, we can compute gradients values just like we did for 1D Perlin noise. 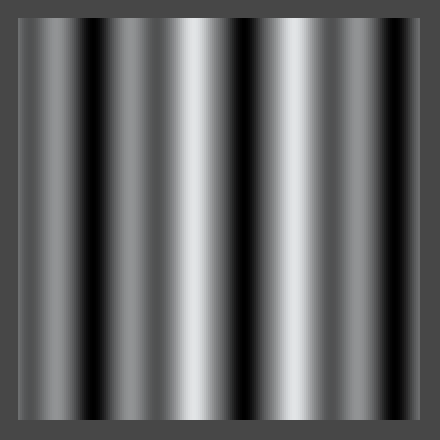 Interpolating four gradients vs. showing only v00. 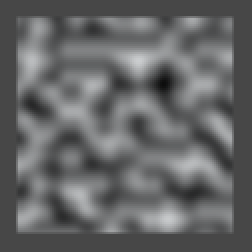 This is starting to look interesting, but the noise has a dominant horizontal and vertical alignment. 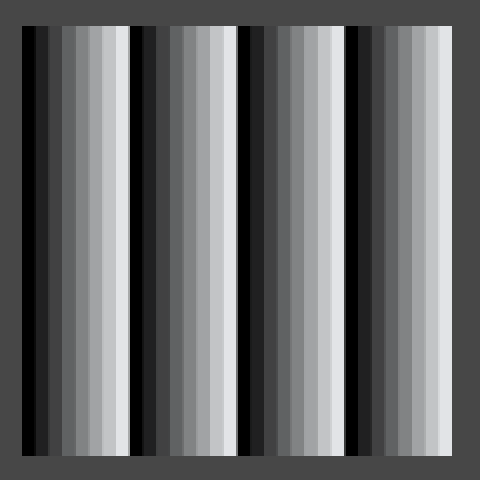 What would happen if we made our gradients diagonal instead? 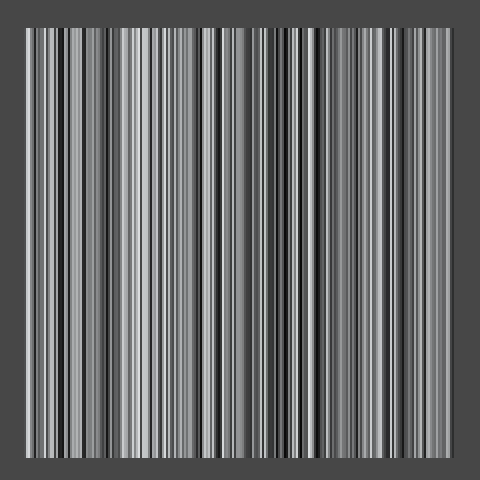 Diagonal gradients that go out of range, interpolated vs. only v00. As you probably expected, we're now seeing a strong diagonal alignment. We also see that the noise goes out of range. That happens because when the four corner gradients of a lattice cell all end up pointing towards its center, the final interpolated value in the middle will be 1. So we shouldn't double our result when using these gradients. While using either axis-aligned gradients or diagonal gradients doesn't look varied enough, using both at the same time will give us a lot more to work with. But then we better make sure that all gradient vectors have the same length, otherwise their intensity will vary a lot. We can do that by normalizing the diagonals. In this case the maximum value is still reached at the center off a cell with four diagonal gradients pointing at its center, however that value is no longer 1 but √½. So we need to divide by √½, which is the same as multiplying by √2. Unfortunately the square root of 2 is not a rational number, so we cannot write it as a constant. We could write an approximation, like 1.4142136, but let's just use a static variable and have Mathf.Sqrt figure it out. We can still see horizontal and diagonal structures, but the probability of either showing up is equal. But what if we included even more gradients, like using sixteen rotated in 22.5 degree increments? 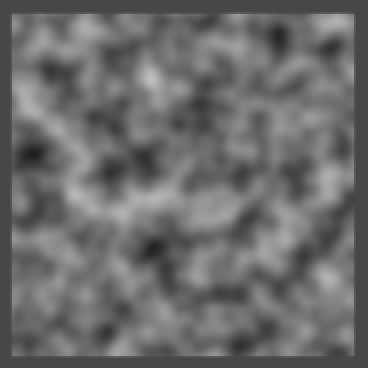 It turns out that this doesn't really increase the apparent randomness of the patterns, so we stick with eight. The same is true for three dimensions. Ken Perlin found that you don't need many gradients. He chose just twelve vectors for his improved noise, each pointing from the center of a cube to the middle of one of its edges. However, twelve is not a power of two, so bit masking doesn't work with that. He decided to lengthen his array by including four vectors twice. He picked four that form a regular tetrahedron so they don't introduce a directional bias. Let us use the same gradients. While we could normalize these gradients, as they all have the same length this is not really necessary. Furthermore, Because each individual vector only uses two dimensions, the maximum possible value is the same as for the unnormalized 2D diagonals case, which is 1. So we don't have to scale the interpolated value at all. The only extra thing we need to do is add another Dot method that works for three dimensions. Because we are using different gradients for 3D than for 2D, the two noise patterns appear slightly different when viewed along the z axis. While the 3D gradients are all the same length when taking all their dimensions into account, when you ignore one dimension this is no longer true. 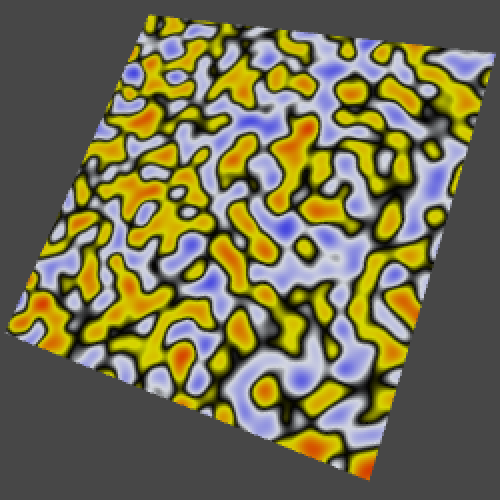 3D Perlin noise, moving to the next z coordinate in the lattice grid. 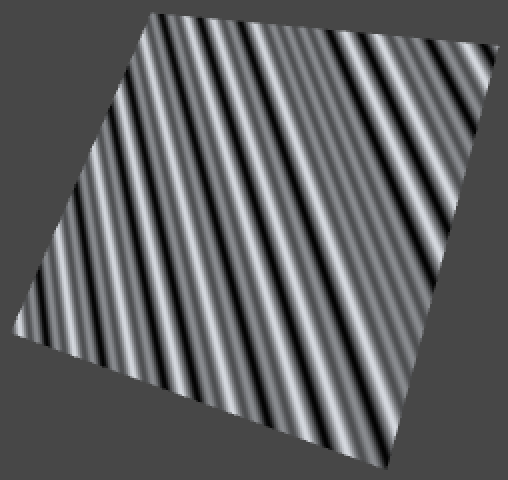 Of course 3D Perlin noise makes the most sense when animating 2D patterns or when really working with three dimensions. 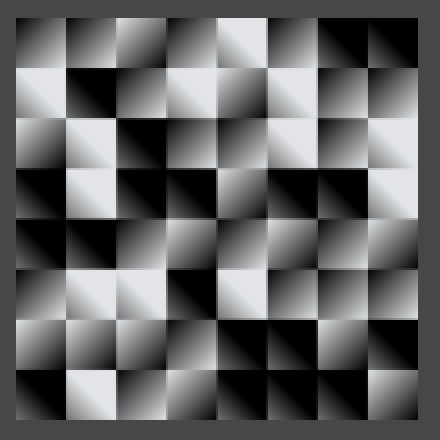 1D, 2D, and 3D Perlin noise with rotation (45,45,0). Because our noise is based on a lattice, its features – though seemingly random – are all the same size. However, many things have both larger and smaller features. Think clouds, mountains, coastlines, and many plants. As you zoom in, you will discover more and more detail. Often, the details look similar to the larger shape, like a branch on a tree is could look like a smaller tree itself, with even smaller braches. These self-similar shapes are known as fractals. Our noise patterns don't have this property, but we can make a limited version of it by combining samples at different frequencies. For example, adding frequency 8 and frequency 16 together. Here the frequency 16 samples represent the details, so they should be less pronounced than the larger features. Because the frequency is doubled, it makes sense to half its strength. Of couse we can go a step further, and also add a frequency 32 sample at quarter strength, and so on. Such a summation of noise frequencies is known as 1/f noise, or fractal noise, or fractional noise, pink noise, and some other names. Let's add a Sum method to Noise that combines two samples, the second at double frequency and half strength or amplitude. We can give it a parameter to determine which method to use, so we don't need to create a separate summation method for all our noise types and dimensions. 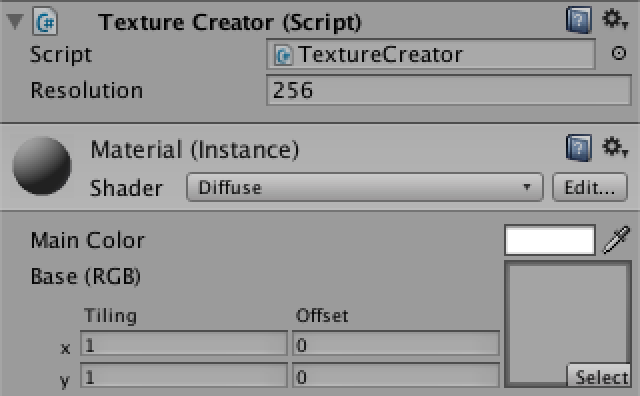 Now TextureCreator.FillTexture can pass its noise method to Sum instead of calling it directly. 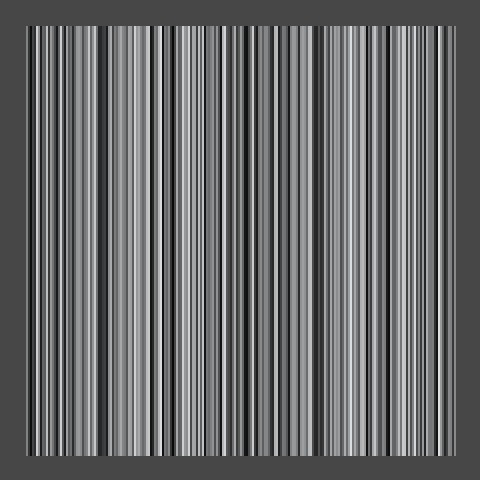 2D Value noise at frequency 4 and 8, separate and summed with 8 at half strength. Of course the range of this summation is 0–1.5, or -1.5–1.5 when using Perlin noise, so to get a normalized result we have to divide by 1.5. Normalized sum, for Value and Perlin noise. Of course we don't always want to sum exactly two samples, so let's make configurable how many samples, or octaves, we want to include. Because each successive octave will be smaller than the previous, at some point adding more octaves won't visibly change the image any more. Besides that, more samples require more computation time, so this also limits how many octaves are practical. Let's add an octaves setting to TextureCreator and give it a range from one to eight. Then pass it to Sum in FillTexture. Adding a slider for octaves. Noise.Sum now has to accumulate all the octaves, at each step increasing the frequency, halving the amplitude, and keeping track of the total range for nomalization. Because it is pointless to ask for zero octaves, let's always compute the first, then loop through the others. 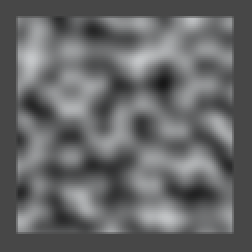 Value and Perlin noise with base frequency 3, from one to five octaves. It is not required that the frequency is exactly doubled each octave, neither does the amplitude need to be exactly halved. The factor by which the frequency changes is often known as the lacunarity, while the amplitude factor is often named persistence or gain. Let's add these options to TextureCreator with reasonable ranges. Lacunarity and persistence with typical values. Of course we need to pass them to the Sum method. And Sum itself has to use them instead of contant values. Two octaves of Perlin noise with base frequency 8, using lacunarity 2, 3, and 4. Three octaves of Perlin noise with base frequency 8, using persistence ½, ¾, and 1. 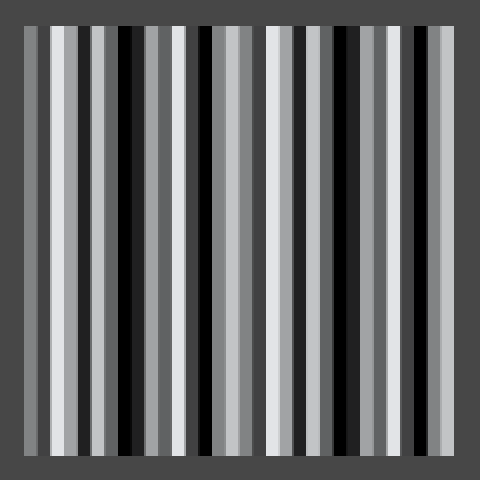 You might have noticed that when changing the frequency or the lacunarity, it looks like you're zooming from the center of the image. This happens when the quad is placed at the origin. Because everything is relative to that point, the same features of successive octaves will overlap, producing lines or cones that are obviously not random. This is a problem in all dimensions. To avoid these artifacts, move away from the origin. Rotated summed 3D Value noise, positioned at (0,0,0) and at (1,2,3). So far we've converted the noise values to grayscale colors, but we need not limit ourselves to that. To allow more interesting color transitions, let's wrap up TextureCreator by adding a gradient to it. If you let the gradient go from black to white, you'll get the same result as before. So design something else instead. As an example, I put a narrow black region in the middle, made the lower half white–blue, and the upper half yellow–red. This will divide the patterns into two parts. 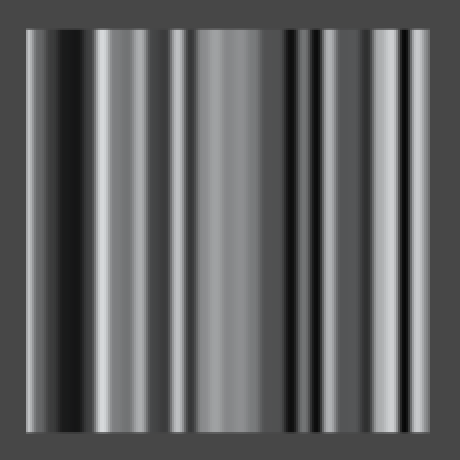 To actually show the colors, instead of multiplying our noise samples with a constant white color, we use them to evaluate the gradient in FillTexture. Colored 2D and 3D Value noise, one octave with frequency 16, and six octaves with base frequency 3. 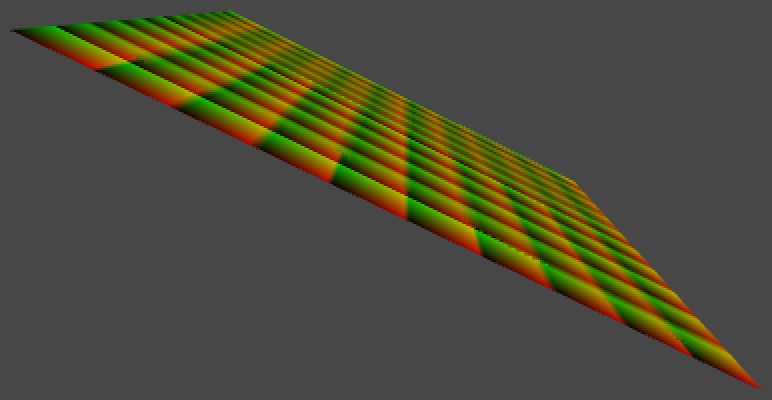 Colored 2D and 3D Perlin noise, one octave with frequency 16, and six octaves with base frequency 3. Of course you can create many different results with other gradients, especially once you start playing with lacunarity and persistence as well. 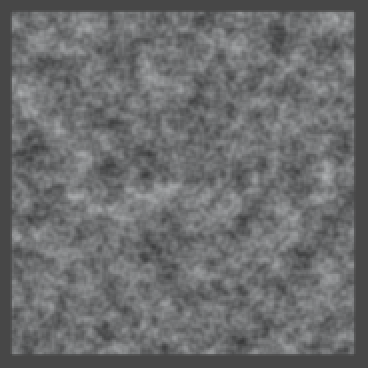 Have fun experimenting with noise settings, or immediately move on to Noise Derivatives. The project after Creating a Texture. The project after Visualizing World Space. The project after Making Noise. The project after Going Into Higher Dimensions. 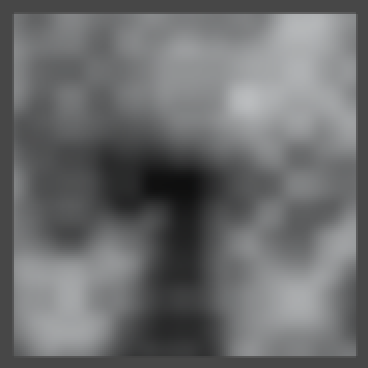 The project after Interpolating Hash Values. The project after Making Fractal Noise. Why create a texture on the CPU, while you could use the GPU? It's a good questions. 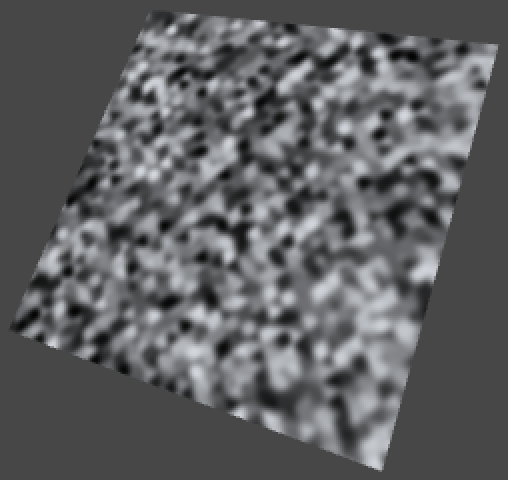 The GPU is very good at this job, and you could even render to a texture so you don't have to compute complex noise all the time. The GPU can also be used for other massively parallel computations that need noise, like mesh deformations and particle systems. But there are lots of other applications of noise, many of which don't benefit from massive parallelism, in which case CPU noise is useful. There are also many situations in which there simply is no access to an advanced GPU, either because of software or hardware limitations. Ideally, you have access to both CPU and GPU noise and can use the best tool for the job. Both approaches use the same noise algorithms, but GPU programming is still quite arcane compared to C# programming. A big part of writing shaders is playing to the strenghts of the hardware and working around its limitations. This distracts from the noise algorithms themselves, which don't depend on specific hardware. So it makes sense to start with CPU noise. Because all hardware are binary systems, they like their numbers in power-of-two increments. 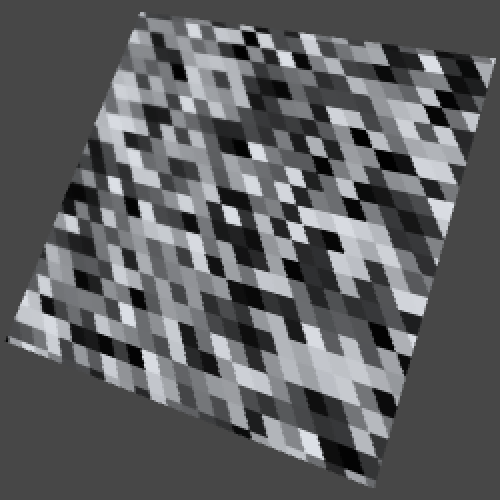 This is most efficient and sometimes even required for textures. That's why you always see the numbers 2, 4, 8, 16, 32, 64, 128, 256, 512, 1024, 2048, and 4096 pop up. The 24 after RGB indicates how many bits are use to store a single pixel. In this case we're only using the red, green, and blue channels, so eight bits – one byte – are available per channel. This means we can represents 28 or 256 different values per channel, and a total of 224 or 16777216 different colors. Mipmaps are downsampled versions of the base texture, each at half the resolution of the previous level. 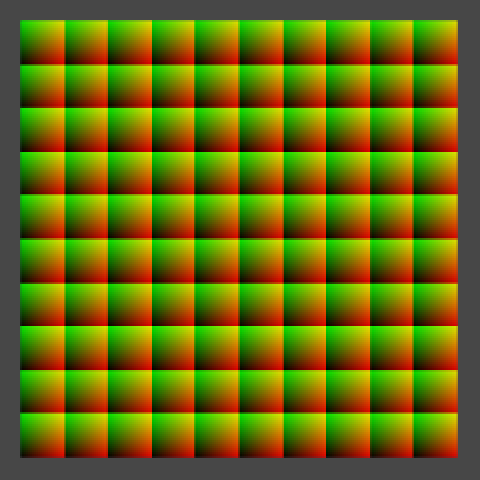 When used, the GPU decides which level to render based on which best matches the output resolution. When a smaller area is covered, a smaller mipmap is chosen. You'll often see two ranges used for color channels, either 0–1 or 0–255. Unity's Color struct uses the first range. The 0–255 range is an obvious choise when using one byte per color channel. However, that means your color representation is tied to whatever fidelity you're currently using. If you were to later switch to using only four bits per channel, or to sixteen bits per channel, then what? Because everything has been expressed in the 0–255 range, it is either too expensive, impractical, or simply impossible to change the range. You'll have no choice but to keep using it, even though it no longer makes sense. That is the curse of backwards compatibility. An implementation-agnostic range like 0–1 avoids this problem. On the other hand, by sticking to the range that's really being used, there is no conversion step necessary, which costs performance. That's why Unity also has the Color32 struct, which uses bytes. Besides simple values and object references, you also store method references in a variable. Such a variable is known as a delegate. A delegate type is defined like a method, except that there's no code body. You can assign any method to such a variable, as long as its parameter types and return type match. The variable can then be called like a normal method. Actually, a delegate variable acts like a list. You can add multiple methods to it, which will all be invoked when calling the variable. That's why we're adding to and removing from the undo delegate. Had we directly assigned to it, the entire method list would've been replaced. Being anisotripic means that whatever you're doing is directionally dependent. This case, it means that how you filter depends on the view angle. If we were to rotate the view or the quad around the x or y axis, the quad's projection will turn into a rectangle, and eventually a line. As this happens, one of its dimensions visually gets smaller, while the other stays constant. 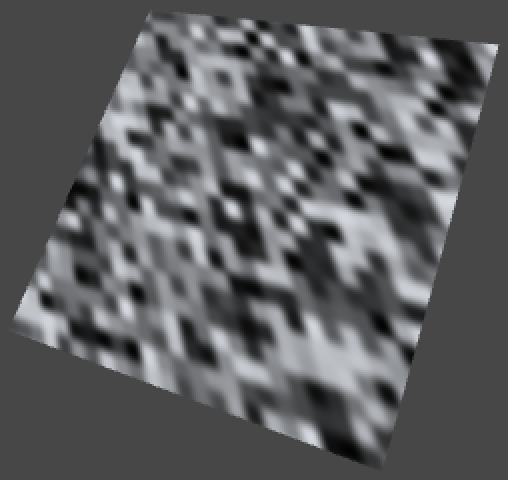 As the smallest dimension dictates which mipmap level is used, the smaller dimension will look fine, but the larger one will become too blurry. Anisotropic filtering solves this by also including stretched mipmaps that are downsampled in one dimension while the other is held constant. Transform has a hasChanged property which is set to true whenever one of its values is changed. So it is useful to check whether the position, rotation, or scale has been modified since the last time you checked. However, nobody sets hasChanged back to false, because there is no universal moment when this should happen. It is up to you to reset it. While && is the boolean AND operator, & is the bitwise AND operator. It performs the same logic, but on each individual pair of bits of its operands. So both bits of a pair need to be 1 for the result to be 1. For example, performing the bitwise AND operation on the binary numbers 10111010 and 00000011 results in 00000010. Effectively, the second operand has erased all but the rightmost two bits of the first operand. The decimal representation of these numbers are 186, 3, and 2. As it turns out, 2 is the remainder of dividing 170 by 4. This makes sense, because the mask cuts off everything above 3. So you can use the binary bit masks 1, 11, 111, 1111, and so on to produce the remainder of dividing by 2, 4, 8, 16, and so on. But how does this work for negative numbers? The int type is used to represent signed 32-bit integers. This means that they contain 32 bits, of which one is used to indicate the sign of the number. The sign bit is placed in front of the most significant bit. As the bitwise AND operator doesn't care about the meaning of individual bits, the sign will be masked out like any other bit, effectively making the remainder positive. However, this is not the only difference between positive and negative numbers, because they're stores using a two's complement representation. This means that when you drop the sign bit, -1 becomes 231 - 1, - 2 becomes 231 - 2, and so on. The result is that masked number sequences aren't mirrored around zero, they simply keep repeating. Typically, when desiring a smooth interpolation, people will use the 3rd degree polynomial 3t2 - 2t3, which is known as smoothstep. This works fine, except when the noise is used for bump mapping. In that case you're effectively showing the derivative function, which for smoothstep is 6t - 6t2. Because the derivative of that function – the second derivative of smoothstep – is 6 - 12t, its rate of change is not zero when t is zero or one. This causes visible discontinuities at lattice boundaries as the curvature suddenly changes direction. For his improved noise, Ken Perlin suggested to use 6t5 - 15t4 + 10t3 instead. The first derivative of this alternative function is 30t4 - 60t3 + 30t2 and the second derivative is 120t3 - 180t2 + 60t. Both are zero when t is zero or one. We name it so because this function is known as the dot product, or sometimes scalar product. Simply put, the dot operation between two vectors (a,b,c) · (x,y,z) yields ax + by + cz. The dot product shows up a lot when performing geometric calculations with vectors. For example, (x,y) · (x,y) yields x2 + y2, which is the square length of the vector. Also, the dot product of two vectors of unit length yields the cosine of the absolute angle between them. The Pythagorean theorem states that for a right triangle with edge lenghts a, b, and c, a2 + b2 = c2, where c is the length of the side opposite to the right angle. In case of our diagonal gradients, a and b are the same length while c is 1. Therefore a2 = b2 = ½.